How about a nice mega slice of gold glitter?! Collaborating with Toy Pizza, Clutter Studios have brought to life the first soft vinyl production Knights of the Slice! 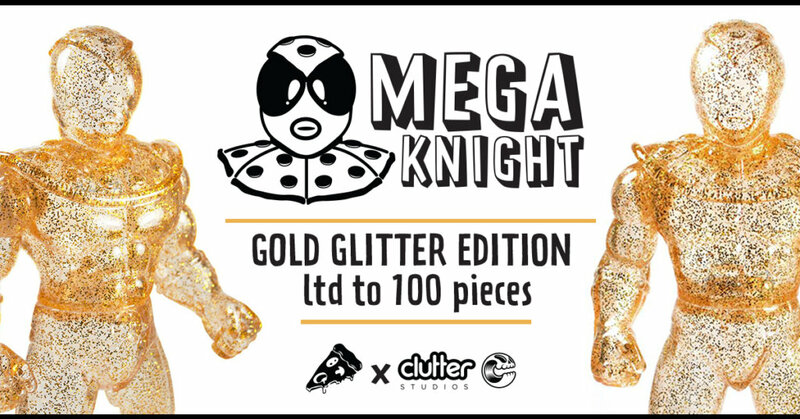 Mega Knight Gold Edition is hitting up DesignerCon this week over on the Toy Pizza booth #2531! Based on original art by Sexual Youkai (seen below) and standing at 8inches tall, this Soft Vinyl production is about to get its first release in beautiful clear and gold glitter vinyl!! Limited to 100, these will be priced at $100 a piece. Yum!